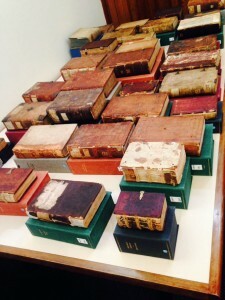 On Wednesday, Nov. 18, 2015, the Burke Library hosted a workshop, organized by Columbia Libraries’ Conservation Department, for New York City curators and conservators on the study of the provenance of historic bookbindings. 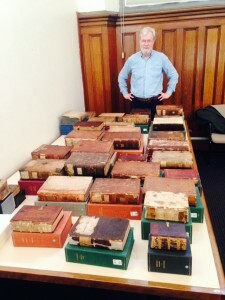 Dr. Nicholas Pickwoad, Director of Ligatus Research Centre at the University of the Arts London, led an all-day session featuring more than 70 books from the Burke Library’s celebrated van Ess Collection. The van Ess Collection is ideal for such study and is noted for its many well-preserved contemporary bindings from the fifteenth and sixteenth centuries. Because many of the books in the van Ess Collection were never “updated” — as was frequently the case when later owners or repositories would rebind or repair in ways that removed or obscured important earlier evidence of the books’ manufacture and use — important features revealing how they were constructed have been preserved, which in turn provides many insights into the technical, artistic, social, and economic spheres in which bookmaking played such an important role. Features preserved in the van Ess bindings offer important evidence concerning their provenance and date (where and when they were bound), showing varieties of regional and local practices and patterns. Dr. Pickwoad led the group through a careful exploration of van Ess volumes, examining features such as sewing styles, board material, and board covering to infer where and when particular bindings might have been made. Researchers utilizing printed books in their research — in many cases the most abundant type of evidence available to scholars — will find in the van Ess collection a rich body of evidence for study of the early modern world. The Ligatus Centre has created a new resource for the description of historic bookbindings: The Language of Bindings (LoB) Thesarus. 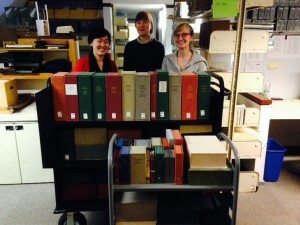 This important tool will be a standard resource for scholars, librarians, and others who work with rare books. This entry was posted in Collections on March 4, 2016 by Matthew Baker.